A couple of you commented on the belt that I was wearing with my ruffled petal shirt from Monday's post. It is technically a belt , but I kind of fashioned it out of what I had on hand. I thought that I'd share it with you. I also have a couple of more in depth (and slightly more belt like tutorials coming). So I recently made a trip to one of my favorite local Home decor fabric stores. They have a huge collection of upholstery textiles that I love, love, love. I was looking through the fabric when I came upon this faux leather fabric. They were having a sale on faux leather and I instantly came up with a couple of projects that I wanted to try (one being a belt). Originally I believe that it was being sold for $12.99, but I got it 25% off, and I only bought 1/4 of a yard, so it didn't cost me much at all. You only need an inch or two depending on the width of the belt that you want. I ended up purchasing some brown and red faux leathers. 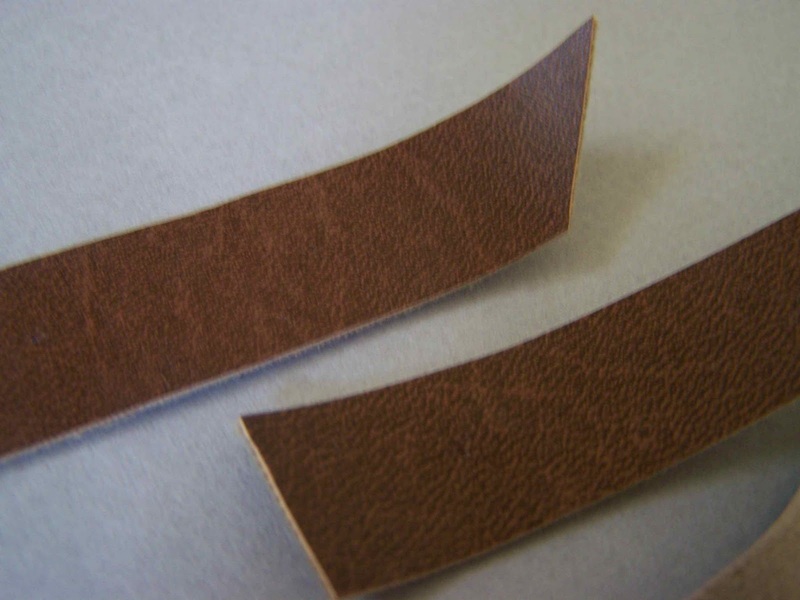 I went in on a free swatch Friday, so I picked up a swatch cut (1/8 of a yard) of some faux black leather for free (plenty to make a belt or two). 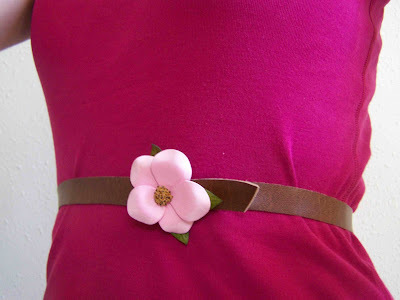 When I was working on my ruffled petal t-shirt I knew that I wanted a skinny belt to break up my long torso. I didn't have the hardware to make a belt, but I really wanted a belt for the photo shoot. I ended up finding this pin in my jewelry box and decided that it could double not only as a little bit of bling, but also as a fastener. I wrapped a strip of the faux leather around my waist, cut it about 4 " longer than my waist, and fastened the overlap with the pin. It was so simple. I decided that I'd try out a few different pins for a different effect. I was far to lazy to change my clothes when I was taking pictures, so just squint if the pink is too much for your eyes. Now I didn't punch any holes in this belt, but you definitely could if you didn't want to have random puncture marks in the belt. 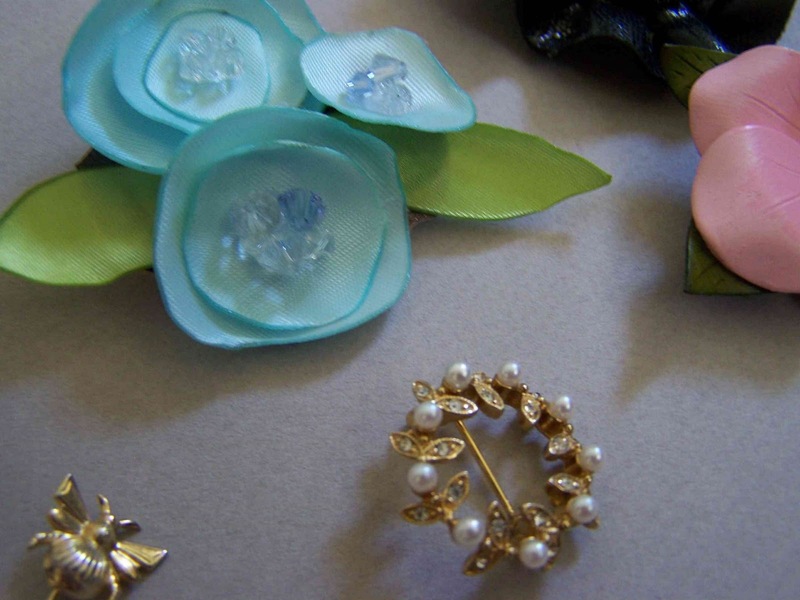 The pin from my photo shoot along with the pink flower and the bee were my great grandmothers. I am not much of a pin person, so this was a nice way to wear them. I also made a couple of really simple pins using satin ribbon and buttons. Faux leather isn't ideal, but it worked well in this project, and I am really excited to try it on some additional projects. I hope that it motivates you to dig through your jewelry box and find new ways to wear your pins and brooches. 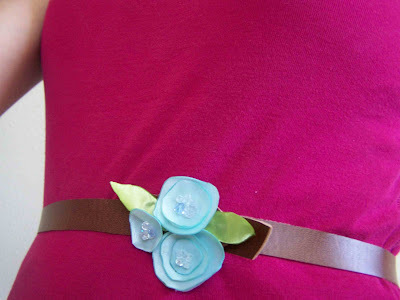 Like I said, I have more belt making tips to come so stop by again tomorrow for some additional ideas on making simple and inexpensive belts. You can find out where I'm partying today by clicking here. I love this! 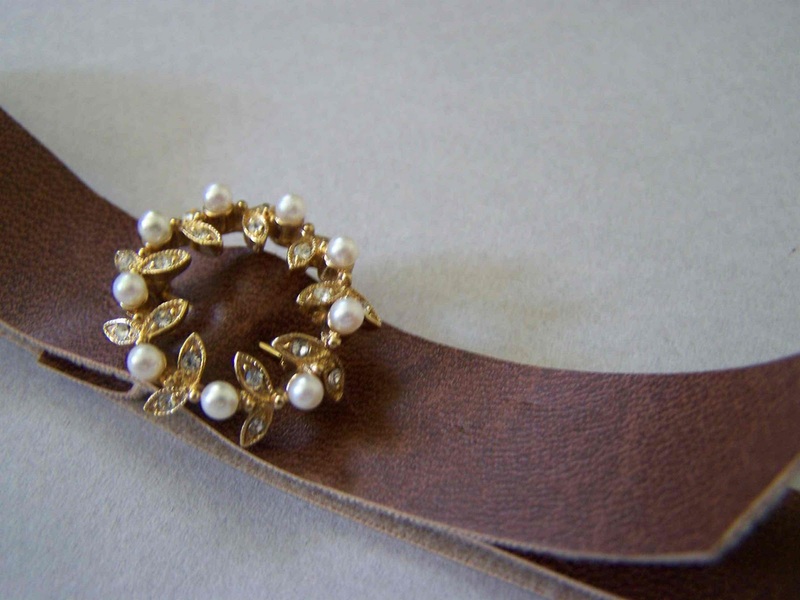 I'm going to have to try this with some of the brooches I've been collecting. I love them but don't really wear them.